ATI Town Hall Blog: What standards will be assessed on the District Benchmark Assessment? What standards will be assessed on the District Benchmark Assessment? Have you ever been surprised that student knowledge of a specific standard was tested on a benchmark assessment? Did you know that there is a report in Galileo that will map what will be assessed on a test? Galileo allows users to print a Test Blueprint report for any published assessment created in Galileo, be it a Benchmark Assessment or a Formative Assessment. The Test Blueprint shows the percentage of the test that covers each learning standard and each strand/concept. You will know the standards that are going to be assessed, and reflect on what degree your instruction mirrors the test. 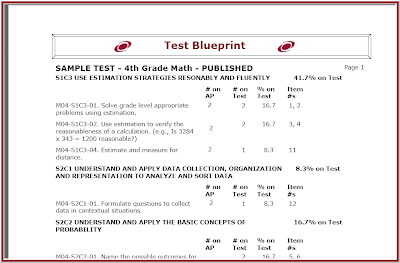 The Test Blueprint also lists the number of items on a given assessment that relate to each learning standard. This allows you to identify the standards that have more weight. Typically, these are “power standards”, or standards that have been identified as being essential to student learning. Knowing the standards that are more often assessed, allows you to focus your instruction on these valued standards. Does your district complete the Assessment Planner (use customized assessments)? If so, the Test Blueprint will also display the number of items being requested by your district for specific standards. This gives you some idea of which of these standards may appear on future district benchmarks. This information is especially helpful if you are running the Test Blueprint on a formative assessment. 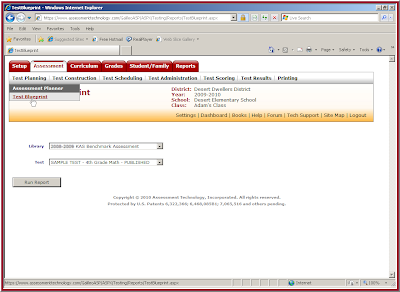 It allows the user to see the alignment of classroom assessments with the district benchmark assessment. A user will find the Test Blueprint in the Assessment area. As your next assessment window approaches we recommend that you take some time to analyze this powerful report and reflect on the instruction that has most recently occurred in your class.